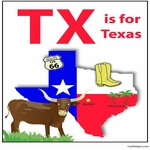 This section lists reading comprehensions on edHelper.com with references to the state of Texas. These reading comprehensions were not written specifically for the state theme unit. Bessie Coleman: "World's Greatest Woman Flyer"
How Is Paper Money Made? Twist and Shout: A Tornado is Coming!